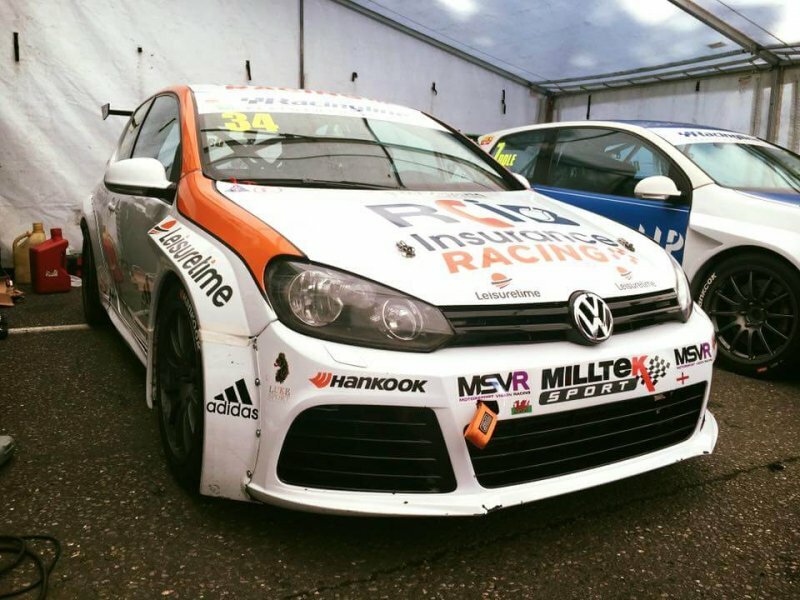 Favourably bright and sunny Brands Hatch circuit welcomed a swarm of enthusiastic 2017 VW Cup drivers on the 6th of August, who were ready to tackle the Kent based track. As the green lights went, so did the drivers, rushing to reach the chequered flag at the end of the 2.61 mile long Brands GP loop. Team HARD’s, RCIB Insurance Racing sponsored Jamie Bond showed some great steering and successfully qualified in P1. JWB Motorsport’s drivers Phil House and Kieran Gordon both finished in P2 and P3 respectively. Race 1 came to the start with a Team HARD front row lock out. Shortly into the race a harsh contact between Phil House and Tim Docker led to a hard hit to the side, leading to a slide down Paddock Hill for Scirocco. This was then followed by a multiple car slow down while passing the scene, however Paul Ivens couldn’t avoid the spinning Scirocco which spiked him into the air before wildly rolling multiple times and finally coming to a rest on his roof. Stephen Johansen’s Polo was next to get caught up in the accident, ending up in the tyre wall after a strong impact. The heavy multi-impact caused the race to come to a halt. With a red flag waved the medical teams rushed to the drivers. The worst off Paul Ivens had to be removed from the car and stretched off, before eventually being taken to the hospital for further checks. After the marshals and medical teams cleared the incident, drivers were allowed back onto the track, however with the race being shortened to ten minutes there was no time to waste. Jamie Bond held on to his advantage and finished the race first with Bobby Thompson in second and Simon Walton in third. The second race meant that three drivers were now unable to appear on the grid following the earlier incident. Two more drivers, Russell Joyce and an RCIB Insurance sponsored driver Toby Davis had to also leave the track. Davis’ driver side door flew open coming up to the last leg of the race due to previous contact forcing him to pit and eventually retire whilst sitting third on track. however this didn’t mean that there would be any less thrilling scenes for the spectators to see. Passing the waving chequered flag was the current points leader Tom Witts who took the pole, with Kieran Gordon taking second and Jamie Bond in third place – the top three separated by less than a second bunched together. Matthew Evans collected the Sportman Trophy honours after finishing the race in eleventh place.